여러분이 즐기는 게임의 콘텐츠를 찾아 다운로드하고, 또 만들어 보세요. 여러분이 즐기는 게임을 위한 '플레이어 제작 콘텐츠'를 아래에서 찾아보세요. 제작에 관심이 간다고요? 여기서 더 많은 정보를 알아보세요. 여러분의 훌륭한 아이디어가 수많은 사람들이 플레이하는 게임에서 사용되는 것을 꿈꾼 적이 있나요? 이제 Steam 창작마당과 함께라면 가능합니다. 바로 여기서 여러분이 가장 좋아하는 Steam 게임의 새로운 콘텐츠와 모드를 찾아 다운로드하고 평가할 수 있으며, 심지어 여기에 여러분의 창작물을 올릴 수도 있습니다. 다양한 종류의 게임이 Steam 창작마당을 각자 독특한 방식으로 사용합니다만, 변함없는 사실은 이 모든 것을 전부 '여러분같은' Steam 커뮤니티의 일원이 만들었다는 것이죠. When preparing the Workshop page for your mod or item, you now have the option to include a 3D Sketchfab preview of your item along with your videos and screenshots. This can be used to provide an interactive 3D presentation of your model, scene, or item that users can zoom, pan, or rotate around to get a better view of your submission. To include a Sketchfab preview, you’ll need to create a free account on Sketchfab’s website (http://sketchfab.com/) and upload your model there similar to how you go about posting a video to YouTube. Once your item has been posted to Sketchfab and you have a page on their site, you may enter that URL in the new field provided in the Steam Workshop when editing the screenshots and videos for your item. The Sketchfab preview can also be inserted into Steam Community Discussions, Announcements, and Greenlight submissions. We're going to remove the payment feature from the Skyrim workshop. For anyone who spent money on a mod, we'll be refunding you the complete amount. We talked to the team at Bethesda and they agree. We've done this because it's clear we didn't understand exactly what we were doing. We've been shipping many features over the years aimed at allowing community creators to receive a share of the rewards, and in the past, they've been received well. It's obvious now that this case is different. To help you understand why we thought this was a good idea, our main goals were to allow mod makers the opportunity to work on their mods full time if they wanted to, and to encourage developers to provide better support to their mod communities. We thought this would result in better mods for everyone, both free & paid. We wanted more great mods becoming great products, like Dota, Counter-strike, DayZ, and Killing Floor, and we wanted that to happen organically for any mod maker who wanted to take a shot at it. But we underestimated the differences between our previously successful revenue sharing models, and the addition of paid mods to Skyrim's workshop. We understand our own game's communities pretty well, but stepping into an established, years old modding community in Skyrim was probably not the right place to start iterating. We think this made us miss the mark pretty badly, even though we believe there's a useful feature somewhere here. Now that you've backed a dump truck of feedback onto our inboxes, we'll be chewing through that, but if you have any further thoughts let us know. The Steam Workshop has always been a great place for discovering community-made mods, maps, and items for a variety of games. 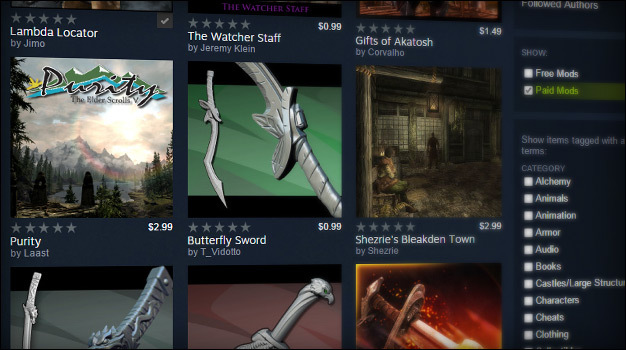 Starting now with The Elder Scrolls V: Skyrim, the Workshop is also a great place for community content creators to earn money by selling their greatest works. We think this is a great opportunity to help support the incredible creative work being done by mod makers in the Steam Workshop and to encourage more top-quality work. This new feature allows mod authors to choose whether to list their items for a fixed price, for pay-what-you-want, or to make their item available for free. As a customer and fan of Skyrim, you're able to explore both paid and free mods, quests, and items. With over 24,000 free mods available for Skyrim in the Steam Workshop, there will always be lots to do and explore for free. Now you can also find mods with a specified price, or mods where you can choose how much you wish to support the creators. The price is up to the mod creators. When shopping for anything, it's still important to spend a little time learning about any product you are about to purchase. But, if after purchase you find that a mod is broken or doesn’t work as promised, you can easily get a refund of that mod within 24 hours of your purchase. View the full refund policy here. If you're new to Skyrim and haven't yet tried it out, now is your chance. Available now through April 26th, Skyrim is free to play. Just visit the Skyrim store page and click the 'play' button to download and start playing. If you decide you want to keep the game, it's also on sale for 75% off regular price! Whether you're just getting started or are already a professional artist or developer, now you can make money from your creations in the Steam Workshop. Starting with The Elder Scrolls V: Skyrim, you can make new cosmetic items, custom skins, fancy houses, epic quests, entire new cities, or just a new hat for Lydia. Once you've made your creation, you can easily set a price and earn a portion of each sale made through the Steam Workshop. Plus, many more of your favorite Workshop games will support paid content in the coming weeks. Check out the full announcement and FAQ for more details. When we launched the Workshop late in 2011, we expected that it would grow, but not that it would grow this much, this quickly. So far, the total payments made to individuals for the creation of in-game items sold in Team Fortress 2, Dota 2, and Counter-Strike: Global Offensive have passed $57 million. This money was earned by over 1,500 contributors spread out across 75 countries. The limitation of paid, revenue-generating Workshops to Valve content has been an unfortunate consequence of the sheer number of challenges required in order to scale to a global audience of creators and players. Today we're happy to announce that after a ton of work, the first curated Workshops for non-Valve games have opened: Dungeon Defenders: Eternity and Chivalry: Medieval Warfare. This is really exciting news and means that more high quality content will be available for the game you love playing. Plus, purchases of this great new content directly enables those community members to continue practicing their craft and making more awesome content. We expect more curated Workshops to become available for creators and players in various games over the coming weeks and months. The Workshop has continued to grow and a larger number of contributors are now earning revenue from more pieces of content in a wider variety of games. To help answer questions about where revenue is coming from, we're also launching a set of new tools that enable contributors to view real-time sales data for their items as well as view detailed per-item revenue breakdowns and historical statements. Once you have content accepted into a paid, curated Workshop, you'll see a link to "View Your Revenue" from your "My Workshop Files" page. If you don't have any content accepted yet, now's a great time to get involved! We just released an update for the Steam Workshop that adds a voting queue for item selection and a new home page for each Workshop to highlight cool content. Workshops for games such as Team Fortress 2, Dota 2, and Counter-Strike: Global Offensive include a type of items that players vote on to help determine which items can get accepted and made available for use in the game. Workshops with these types of items now have a voting queue, similar to the queue in Greenlight or on the Steam home page. This queue will make it easy to discover new and interesting items to vote on, and will help the game teams get a better measure of community interest on the variety of items being considered for use in the game. Each product Workshop now has a new home page design, helping to highlight the most interesting content in the Workshop, and to also better expose a variety of ways to browse the Workshop. With this new home page, customers can now more easily see mods, maps, or items created by authors they follow, see what their friends are marking as favorites, and read about recent Workshop news from the game teams. This new home page also provides space for games to run special events such as themed contests, or to highlight new types of content supported by their Workshop. This update has automatically applied to all games and software with a Steam Workshop, so just check out your favorite Workshop to see these new features. Added views for most popular items over trailing three-months, six-months, and year. This only applies to ready-to-use content such as mods and maps. Adding tabs lists to the home page for ready-to-use items. These lists include a new 'Most Subscribed' list as well as 'Most Popular' and 'Most Recent'. 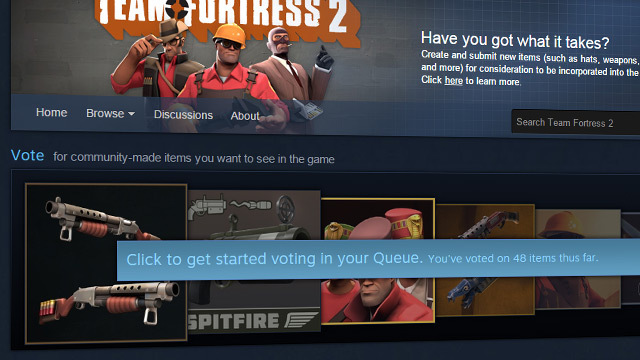 Adding larger voting controls to item voting to support the voting queue. Removing comment threads from the main page for items to be voted on. Giant ASCII art is now relegated to the 'comment' tab on each Workshop item. Hiding star ratings on items to be voted on to help avoid biased voting.